Riding through Lancaster to Washington, D.C. during the Ride of Dreams 2010. It’s 7:30 Sunday morning. 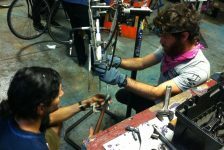 We’re in the Neighborhood Bike Works West Philly Bike Shop, testing gears, making peanut butter and jelly sandwiches, and packing up tool kits. Teenagers stroll in slowly, bleary-eyed, then take their road bikes off the hooks and fill up water bottles. It’s time to roll out for a 50-mile ride. Our ride leader explains the route. We’ll go on roads out past the Main Line, along the Chester Valley Trail for a stretch, past five creeks. There are lots of turns, so stick together, she says. We saddle up and begin to make our way through West Philly, a group fifteen-strong: men, women, teenage boys, and one courageous teenage girl. We cross Girard Avenue, wind through Fairmount Park, and then, surprisingly quickly, we leave the city behind. This is just the beginning: a Sunday ride to train for the big one coming up soon in early July, the Ride of Dreams. Now in its fifth year, the Ride of Dreams takes a group of teenage cyclists and adults on a 250-mile adventure exploring Pennsylvania. 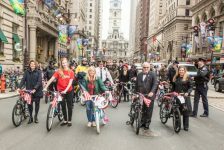 The Ride of Dreams is a major challenge for urban youth, some of whom may have never ventured far from Philly, and most certainly not on two wheels. It is also a fundraiser for Neighborhood Bike Works (NBW). Ride of Dreams Training Ride, June 2014. Photo by Taylor Kuyk-White. Thirty-five miles into our training ride on Sunday, we found ourselves riding as a loose pack along Ithan Creek. A deer shot out of the woods to our right and straight through our group. One rider braked hard, and a second and a third. We skidded to a stop and one of our 16-year old riders shouted, Did you see that? in disbelief. We kept riding, chatting for much of the ride back into West Philly about all of the unusual things we had almost run into on our bikes. 35 riders will depart from NBW’s headquarters in Philadelphia on July 10 and ride west across southern Pennsylvania. This year’s route passes through the foothills of the Poconos near Kutztown, across central Pennsylvania to Hershey, and circles back to Philly through Pennsylvania Dutch Country. Read more and support our Ride at www.rideofdreams.org. Thanks to this year’s sponsors: Keswick Cycle, Firehouse Bikes – Wolf Cycles, Suburban Cyclists Unlimited, Cozen O’Connor, and Greenhill Car Wash.
Ride of Dreams Training Ride, April 2014. Photo by Taylor Kuyk-White. Riding through Lancaster to Washington, D.C., during the Ride of Dreams 2012. Photo by Kelly Campbell. Ride of Dreams Training Ride, June 2014. Photo by Taylor Kuyk-White. Ride of Dreams Training Ride, June 2014. Photo by Taylor Kuyk-White. This year’s riders training on a ride over the Ben Franklin Bridge from Camden to Philadelphia. Photo by Taylor Kuyk-White. The Ride of Dreams reaches its destination, arriving in Washington, D.C.